They've certainly had their worst flu season for a number of years. Like the UK, the past few winters have seen pretty low levels of flu circulating. But this winter it has been different. 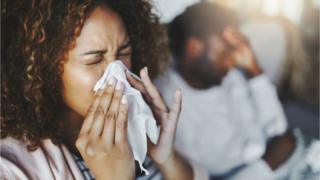 Figures up to the end of August - not even the end of their winter - suggest there was nearly double the number of cases of flu than the average over the past five winters. There is nothing particularly special about this flu - just that there is lots of it around. The symptoms include a high temperature, tiredness, weakness, general aches and pains and a dry, chesty cough. High-risk groups, such as older people, pregnant women and those who have long-term medical conditions or a weakened immune system, are at risk of complications. The most common of which are chest infections. It's not a given - and there's certainly some debate about how closely our winters match the pattern elsewhere. That's not always the case. Last year the vaccine was less effective among the elderly than other groups. Is there a way I can get the jab if I'm not eligible? If you want to protect yourself against flu and you're not in one of the groups above, you can buy the flu jab from high street pharmacies. That's why new flu jabs are produced each year and why vulnerable adults and children are advised to have it every year too.